It's important to remember that some human foods should never be given to cats. A very good reminder and links. I see they have Xylitol on one of your links. That's a new one that's important to mention because it's in so many sugar-free foods an it's really bad for doggies. That was a great reminder. Raw fish?! But I love sushi! Of course, we only got tastes that one time my human's boyfriend put together sushi from scratch. Good to know, Athena! 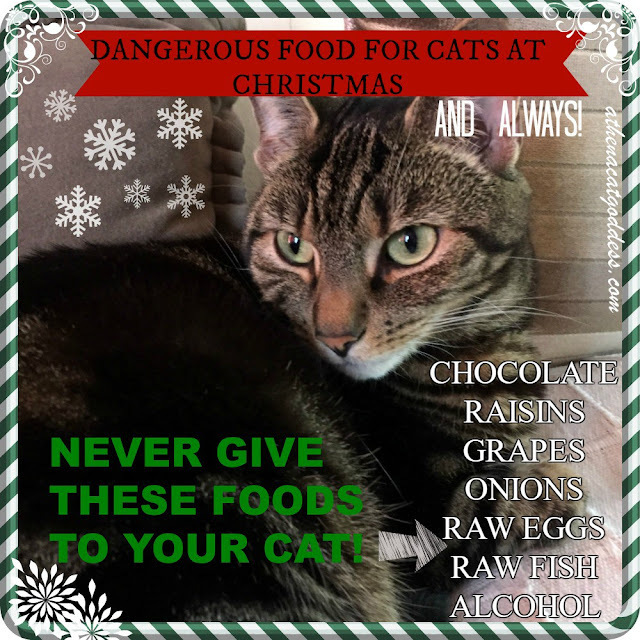 It's so important to know these things, so our cats stay safe and healthy. That is a great reminder. Thank you! Thanks for the reminder, they are dangerous for doggies too. Even a little bit of raw salmon can kill a doggie. This is great, Athena. It's festive and informative, and there's not much better than that. Purrs! Thanks for the very important reminder, Athena! Great way to combine the graphic with the very important info! Great reminders! And you look beautiful as always, Athena! Great tips but I still don't understand the raw eggs one. If I'm not mistaken, people put raw eggs into the raw cat food they make for their cats. So many awful things we have to watch out for. Not just for our furbabies but for ourselves too. I wondered that too. Though I never give Athena any raw fish or meat. Yes, for doggies too. But since this is a cat blog I thought I'd just focus on the cats. Nothing against doggies. I love them too! I am very careful. People tell me I'm too careful. I don't care. I love my little girl and if I had a human child it would be the same. Better safe than sorry. What a great reminder and a beautiful graphic! Thanks for the timely reminder. very good idea to remind people of dangers for cats! There is a similar list for dogs.